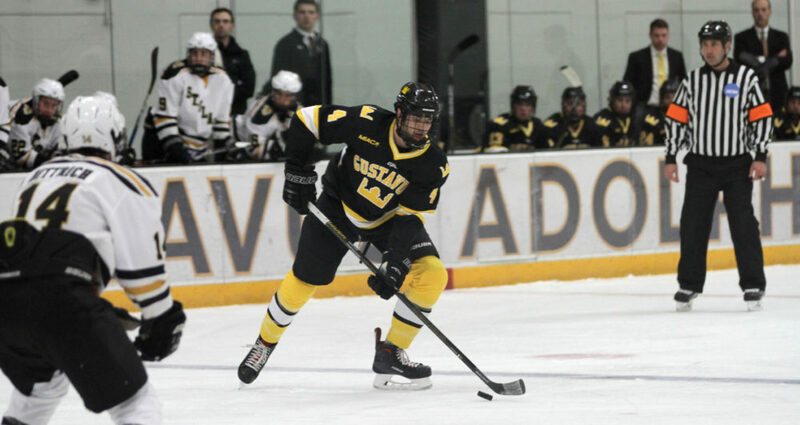 SAINT PETER, Minn. – The Gustavus men’s hockey team is set to host St. Olaf in its home opener tonight at Don Roberts Ice Rink. Faceoff is set for 7:05 p.m. The MIAC opening series will conclude at St. Olaf on Saturday night. Both the Gusties and Oles are coming off 1-1 showings at the MIAC Showcase last weekend. Gustavus beat Saint Mary’s 3-1 and lost to Concordia 3-0, while St. Olaf lost to Augsburg 3-0 and then beat Hamline 3-2. Tonight’s game marks the 104th meeting between Gustavus and St. Olaf in men’s hockey. The Gusties lead the all-time series 66-28-9. Last season the two teams split with the Gusties winning 3-1 on Nov. 3 and the Oles winning 6-2 the next day. The sample size is small, but after two games this season the Gusties average 1.5 goals and allow 2.0 per game. They’ve scored three goals after 80 shots (.038) while allowing four goals on 39 shots (.103). Gustavus is 2-for-8 on the power play (.250) and has killed off all four power play opportunities by its opponents. Caleb Anderson, Nick Klishko, and Brenden Payne have the three goals so far this season. Anderson, Tyler Ebner, and Evan Erickson each have one assist. Chris Amsden was in goal for the 3-1 win over Saint Mary’s last Friday night. He made 15 saves and owns a .938 save percentage. Robbie Goor suffered the loss in Sunday’s 3-0 defeat against Concordia. He made 20 saves and holds a .780 save percentage. Again, the sample size is small, but after two games the Oles average 1.5 goals and allow 2.5 per game. They’ve scored three goals on 52 shots (.058) while allowing five goals on 53 shots (.094). St. Olaf is scoreless on 10 power play opportunities, but has also killed off all eight chances by its opponents. Mitch Dolter, Kyle Rimbach, and Luke Ranallo have each scored a goal. Five Oles have registered one assist apiece. Noah Parker has started both games in goal with a 2.03 goals against average and a .923 save percentage after making 48 saves.